Today	 30 min. Today	 30 min. Typically lightning happens during a thunderstorm, although it can happen at other times. You can't have a thunderstorm without lightning, but you can have lightning without a thunderstorm. Lightning can also be seen during a volcanic eruption, extremely intense forest fires, surface nuclear detonations and heavy snowstorms. Lightning is a huge spark or discharge of electricity in the atmosphere between clouds, the air, or the ground. It is either a negative or a positive electrical charge. They can either go from cloud to ground, intra-cloud or cloud to cloud which never hit the ground. +CG - Positive cloud to ground. 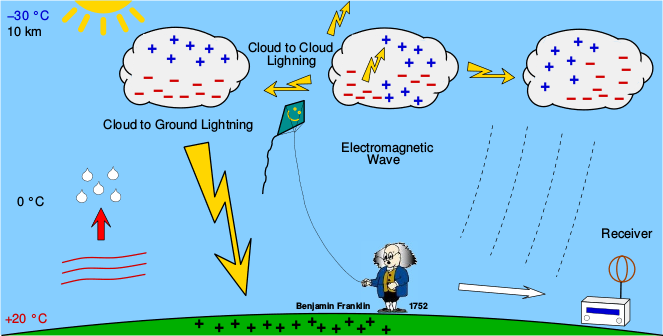 Positive lightning is normally considered more dangerous because its electrical field is stronger. It forms at the top of the storm and the flash duration is typically longer. Its peak charge can be much greater than a negative strike. Also, positively charged lightning strikes can occur near the edges of a cloud or it can strike more than 10 miles away, many times under blue skies when people aren't aware of the danger. When lightning strikes ground what tends to happen is that it fuses clays and dirt in to silicas. The result is often a glassy rock called a fulgurite. Having the shape of a convoluted tube. Fulgurite is found all over the world and is fairly rare. In the lower 48 states there is an average of 20,000,000 cloud-to-ground strikes that have been detected each year since 1989. We use a Boltek StormTraker for the Lightning Detector hardware and Astrogenic NexStorm software for all of our Live Lightning Detection Radar seen on this page. The station is based at our El Dorado Weather location at our Placerville, California, USA location, and covers all of Northern California, all of the Sierra Nevada Mountains, the Tehachapi Mountains down to Los Angeles and Southern, California. It also covers deep into Oregon. The strongest signals are from 300 miles in and there are typically a few shadows due to mountains. 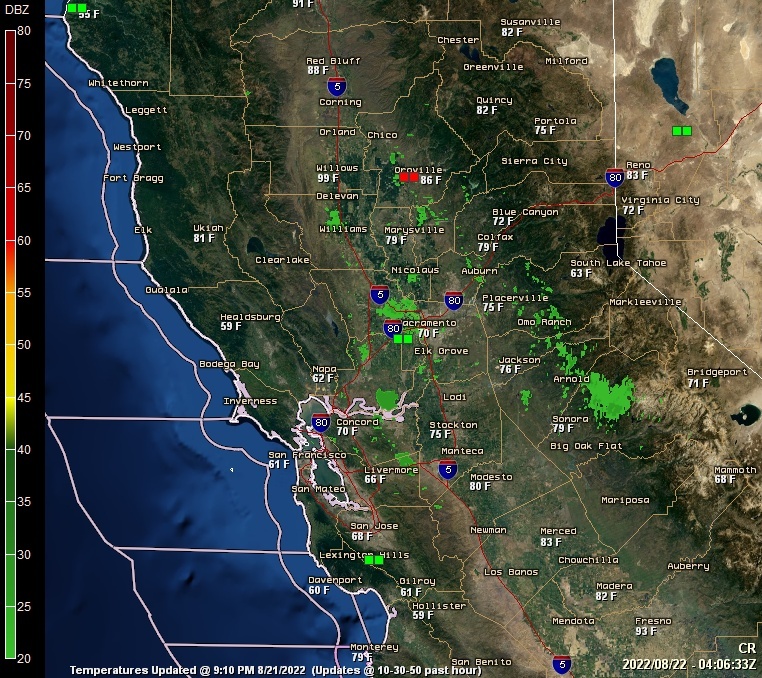 We also keep Live and Archived Weather Data for Placerville, California. Boltek StormTracker is the weather industry standard in lightning detection equipment. Boltek StormTracker detects lightning strikes up to 300 miles away in each direction, which covers a circle around the station with a 600 mile diameter. It plots and tracks lightning strikes directly to the Internet and then to you within about a minute of a lightning strike. Boltek StormTracker Detectors use state-of-the-art technology to make real-time lightning detection that allows you to not only tell if lightning is near but see basically where it is at. It tracks the speed and direction of thunder storms, allowing you to plot the path of the storm and how fast it is traveling. Thus showing you where the tstorm should hit and when the storm will get there. The Boltek StormTracker hardware is being used in conjuction with Astrogenic Systems, NexStorm software.